So I started my weekend with a plan. I've had this quilt top for a while now. I bought the finished top at a LQS. 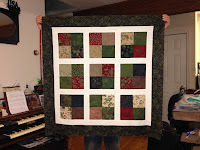 I thought it would be a perfect opportunity to concentrate on the quilting instead of the piecing. That was about a year & a half ago. 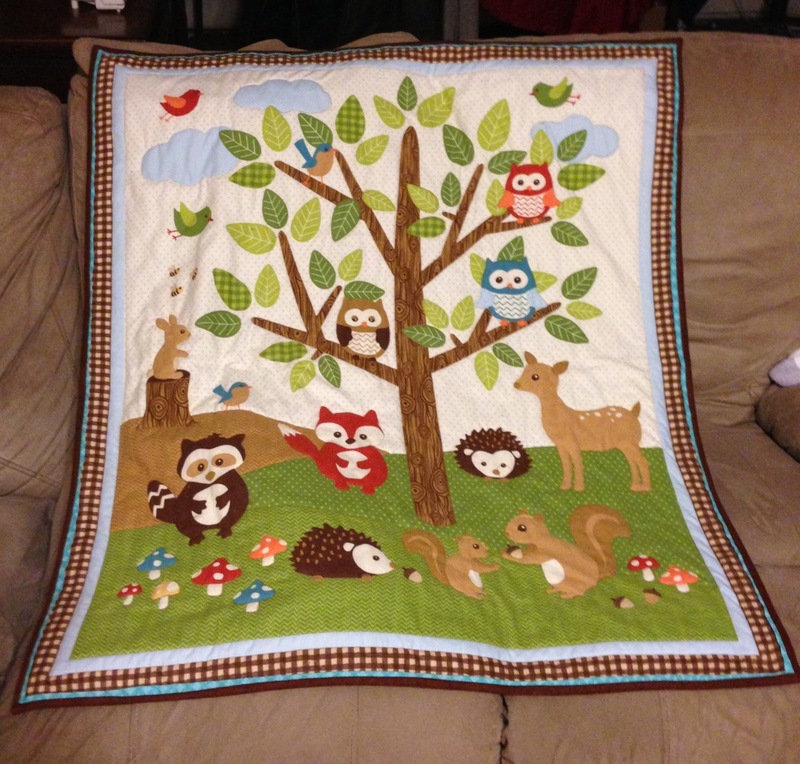 In that time, I've stared at it, moved it to different rooms, held it, hid it, hung it, draped it and tried just about everything I could think of to help me decide how to quilt it. This was the weekend I was going to decide. So on Friday I draped it on the back of the couch, sat at my desk with graphing paper, and started sketching out a design. 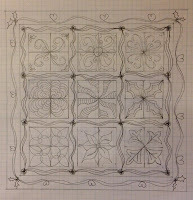 I didn't have anything in mind, but I knew the size, shape, and design of the quilt so that's where I started. By late afternoon Saturday I had this design sketched. The right column took me the longest to work out. I needed to keep the rows and columns balanced while doing a different design in each block. I figured the sashing and border would be the easiest to decide on - Ha! The sashing went fairly quickly, but the border took forever to decide on. With several pencils, a pencil sharpener and my trusty Staedtler eraser, I was able to get it all worked out. I taped the drawing to the wall and lived with it for a while. I think it all ties together quite nicely. I named it and was ready to start quilting. Well, even the best plans can hit bumps in the road. Unfortunately, both spool caps for my Baby Lock Audrey went missing last week. I'm fairly certain Camille got to playing with them and has hidden them somewhere. Hubby and I searched for a good long while and then again before giving up. I've ordered new ones, but until I get them, Audrey has been put away. Yup, she is sitting on the extension table! Not to worry, hubby to the rescue. 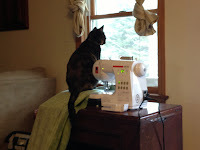 He brought my Kenmore sewing machine, Old Reliable, downstairs for me to use. This is the first birthday present he gave me almost 20 years ago. He also got me the Audrey when a car accident made it difficult to move Old Reliable around - It's a little heavy. With Audrey around, Old Reliable has been in a travel bag. The little mug rug quilt on top (A Little Practice Makes Perfect I) is the test piece I used to make sure all was still running as it should be. To keep myself in good habits, I put a label on it and have finished binding it. It still works as if it were brand new! Now I had a decision to make: Do I start working on Winter's Whimsy or do I work on something else? All the excitement of searching for the spool caps, putting Audrey away, setting up Old Reliable, running to church to cantor mass...well you get the idea. 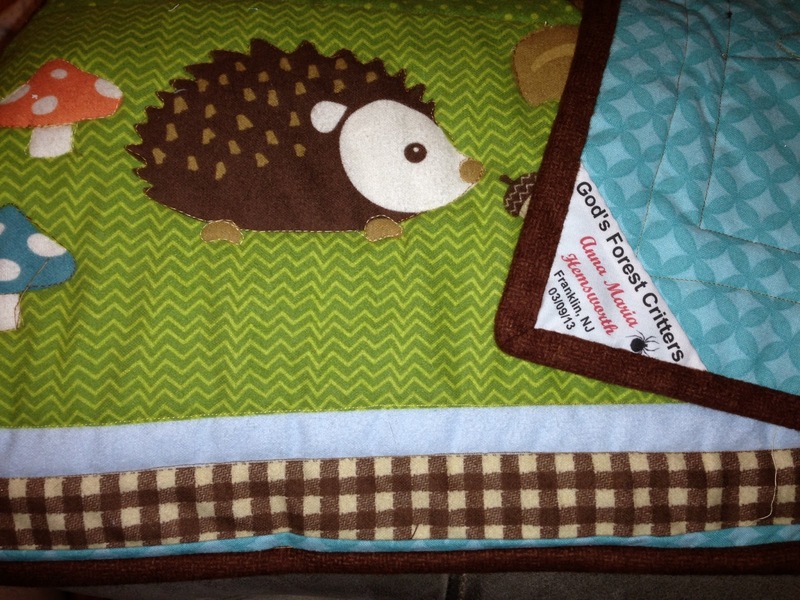 I decided to quilt something with a little less pressure involved. 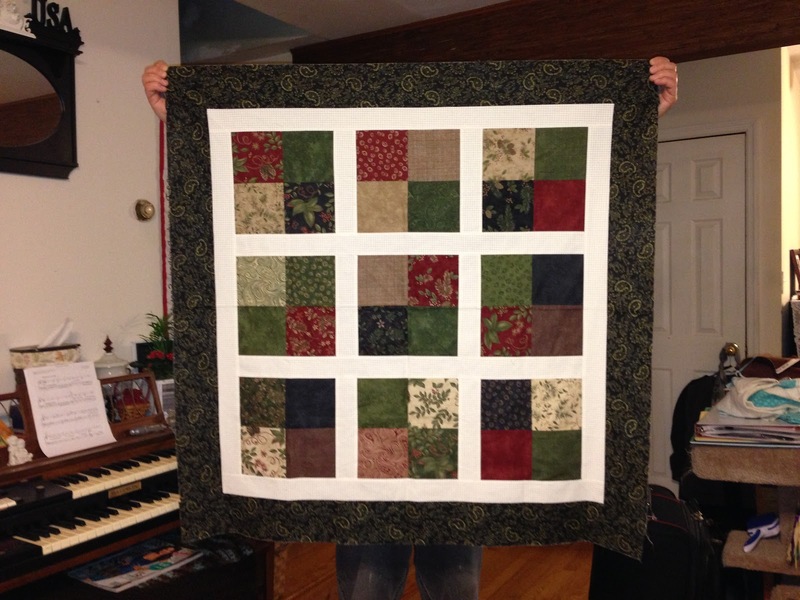 I picked up this flannel panel in January at Quilter's Attic in Pine Bush, NY. It's Forest Friends by Mint Blossom for Northcott. I don't have anyone to give it to but I thought it was so cute. 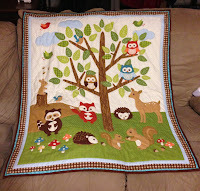 I FMQ'd around everything except the birds and the bees, so the critters, clouds, mushrooms, tree and owls are all a little puffy. I "ditch" stitched the borders which are part of the preprinted panel. I also wanted a little something extra so I added a folded strip of the background fabric to the quilt edge before putting on the binding - like a piped binding without the cording. Flannel front, flannel back, and 80/20 batting makes it nice & cozy. I put the binding on and a label - all done! 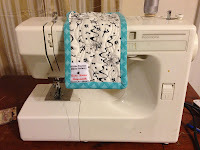 So I did get some quilting done in the last week with each project an FMQ opportunity to try something new and practice FMQing. I also did a few new other things. 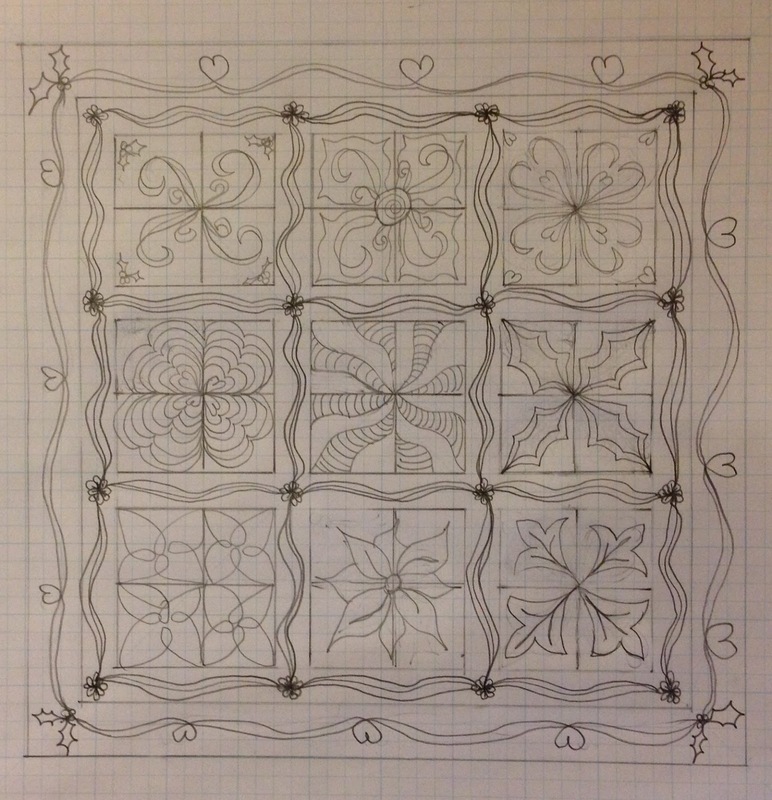 I sketched out a full FMQ quilt design, put the quilt labels on in different ways, and, of course, the not so piped binding. I'll likely be posting through the weekend. I'm unpacking my new Baby Lock Crescendo between sentences so there will definitely be several a few more practice pieces and maybe even a full quilt. 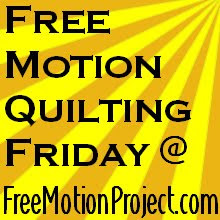 PS: I also started a Goddess Mini Quilt using Leah Day's Free Motion Quilt Project Express Your Love pattern but Camille got sick on it so I threw it out. Luckily I hadn't started any of the quilting yet. I'm going to finish up a few other things before I start working on her again. I want to make a few of them as gifts. 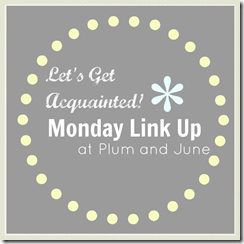 The micro-FMQ'ing should be interesting. I've obviously got to start posting more often. This seems a little long to me. Your sketched design looks fantastic... go for it! Sorry to hear about your Goddess mini-quilt, though. We love these wonderful pets in our lives, but sometimes it can be frustrating! I've learned the hard way to shut our cat out of my studio when I'm not there! Naughty kitty! But where there's a will....and you've managed to overcome! I took out my 10 year old Kenmore this week too. Works like a charm! Doesn't Janome make them? Same thing...lots more economical.